We are engaged in research to inform practice innovation and evidence-informed policy ‘to improve health and social outcomes for people living with mental health and intellectual disabilities'. We conduct research under two main themes: Rehabilitation, Recovery and Wellbeing, and Innovation in Allied and Integrative Health. Our core aim is to strengthen the evidence base informing Allied and Integrated practice for lifelong health and wellbeing. 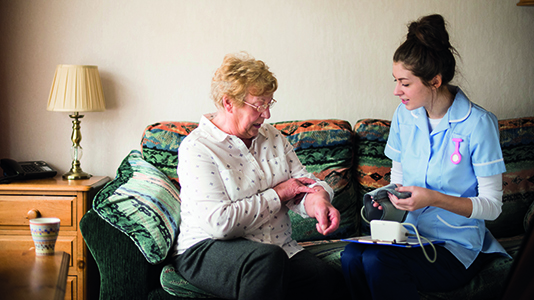 We conduct research relating to the education and development of the health and social care workforce across different roles, settings and circumstances. We carry out research in hospital and community settings to build an evidence base to influence both policy and practice at national and international levels and so achieve the best possible delivery of care to children, young people and their families. There are 15.4 million people in England who have a long-term condition such as cardio-vascular disease or diabetes and an increasing number of people have multiple conditions. We aim to work collaboratively with patients with long-term conditions and those who are ageing, and their carers, to understand their needs and experiences and to develop and evaluate evidence-based interventions to prevent and address long-term conditions in collaboration with service users. Our research focuses on holistic and spiritual care, with a strong emphasis on interdisciplinary and therapeutic communication around death and dying, working across diverse environments (e.g. home, hospital, hospice, care home, prisons). Modern health and social care services are increasingly focused upon assessing risk, ensuring good decision-making and promoting resilience, both at an individual and systems level. We aim to increase understanding of how to comprehend risk, design systems that promote better decision-making and support the expertise of experienced practitioners, reduce individual errors in judgment and develop resilience. Our research focuses on the health needs of individuals, communities and populations and the ways they can be enabled to increase control over, and improve, their health and wellbeing; the effectiveness of behavioural, community and social interventions; and the health promotion role of different professional groups. Global concerns regarding the health of women and girls centre on the impact of sociocultural discrimination and disadvantage, together with sexual violence and abuse of their physical and mental health and their reproductive autonomy. Our research aims to reduce inequalities and lead to improvement in outcomes, care and experience for women.